As I indicated in the last “Get and forget” Post, I thought I’d have a look at Casio this time, regarding models that manage to offer good functionality at a reasonable price point and without overcrowded dials. So many models today have so much data overkill on confusing dials, they may start off being a novelty, but soon are consigned to the back of a drawer! 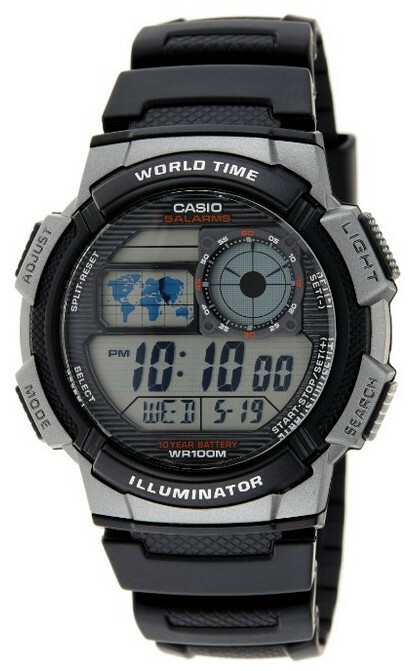 Now I could just feature first model is the Casio AE1000W-1B which itself is a remarkably priced World Time, Alarm watch, really low priced at under $20 on US Amazon. For that you get a rather well designed dial with the main Digital window showing the Time, Day, Date and Month clearly. Also on there is a small seconds indicator and a Time Zone map – a tad gimmicky maybe but they don’t distract from the main view, so I can forgive that. 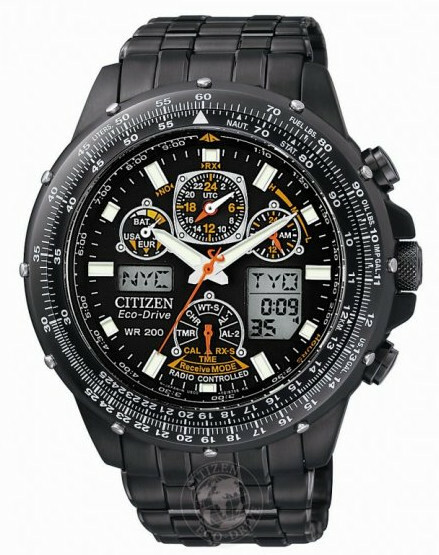 Functions include 48 cities World Time, Alarms, Stop Watch etc. and a 100m Water Resistance in a neat case. The only down side for being the integrated strap/bracelet, which unfortunately is a feature of many Casio models, but that apart this model does represent serious value for money. But I’d rather major on the classic Radio Controlled (two receivers) Casio WVA-470DE-1AVEF sold here in the UK and Europe with appropriate DCF and MSF Radio reception – that is Mainflingen in Germany and Anthorn in the UK. Being Solar Powered this watch never needs a battery. With 2 receiver Radio Control assuming it receives a signal from the appropriate Atomic Clock each day the accuracy is guaranteed and correct within the UK and Europe. 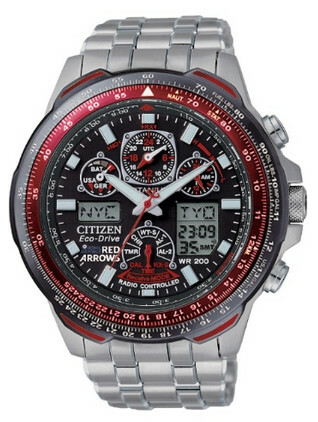 It has good functionality with World Time, Chronograph Stopwatch to 1/100sec, 3 Alarms, battery check, signal check, hour beep, Neobrite analog hands and is Water Resistance rated to 10bar or 100m. It also features an LED backlight. It’s also one of the better sized models (as was the Casio Oceanus) at a neat 42mm x 12mm and even though is analog/digital it has a really neat and classic analog appearance. It has a solid stainless steel bracelet with a double push button clasp and is adjustable by use of removable links (again as the Oceanus) using small tapered pins and sprung holding collars. A point to bear in mind if adjusting/removing links, is to take great care and NOT lose the small link pin collars. 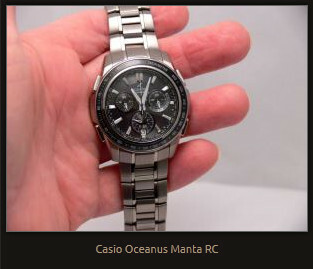 (When I sold on my Casio Oceanus I included a letter to the buyer explaining just how to do it, as I was concerned he might make a mess of it and then claim a refund for a faulty strap – which it wasn’t of course). Basically the link pins slide not only into the bracelet segment, but through a very small steel collar – it is this collar that grips the pin. Lose it and you lose the integrity of the whole bracelet as the pins will fall out. However it is a good comfortable bracelet, just take care if resizing. The price for this model’s functionality is under £100 which considering it’s predecessors represents great value for money. I know of three friends who have this model and they use it as their main watch and bearing in mind they each have watch collections too, it obviously says a lot for this model. For me I particularly like fact that it has not been G-Shocked with plastic panels stuck all over it and has an uncluttered dial considering the functions. Note the luminous analog hands time and the digital time are always in synch. ie: they are not separate and both automatically adjust together on signal reception. It also has a neatly defined center seconds hand. The digital window is a good size without encroaching the dial yet large enough to read clearly. The four pushers are neat and unobtrusive, though quite large enough for the whole fingertip when operating. 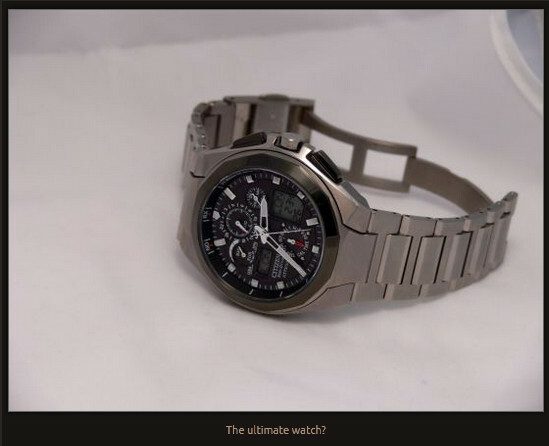 At under £100 this is quite an achievement when you consider that in 2009 I had the very latest in RC models – the Casio Oceanus Manta and the Citizen Attesa ATV53-2833, the latter I featured here in my Post of 2009 as the “ultimate” watch. Both models cost over £700 at the time! So on a cost/function basis this represents a quantum leap in terms of what was then available. It certainly shows how times have changed and this little gem with it’s understated and uncluttered look considering it’s functionality – is a neat buy. 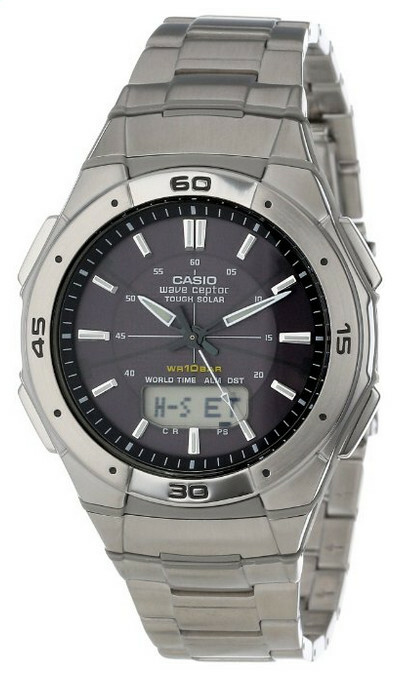 I like most aspects of this model and Casio have excelled in producing a watch, which is both high tech’ and low cost. 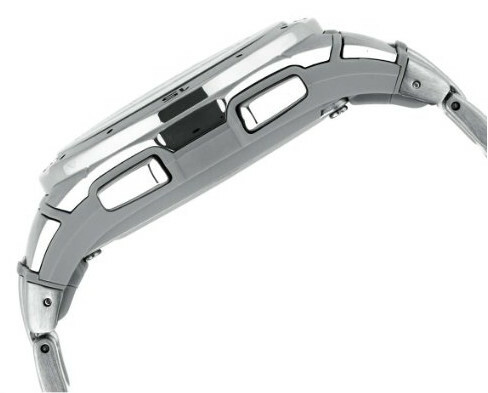 Their expertise in the use of plastics is evident as the case is a lightweight composite of metal and plastic, which apart from reducing cost, has resulted in a smooth curved profile that fits most wrists very neatly. They’ve just about managed to tick all the boxes, as they say. Bar one in fact. That is there is no quick “swap” of Home tome to a destination time, despite this being a World Time watch. You can read a selected World Time digitally, but not analog, unless you change Home time to your destination time which is a rather fiddly. To get a watch with this functionality and looks at such the price is presently unmatched by other manufacturers from what I’ve seen. The competition tends to be composed of either very cluttered dial designs or much more expensive prices or both. 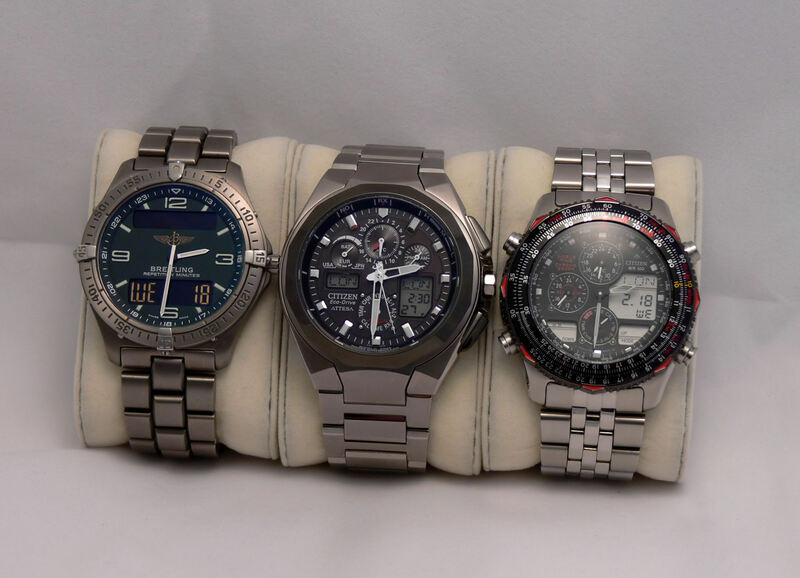 (check out Watchshop under RC watches and you’ll get my point about cluttered dials). Of course my favorite Radio Controlled watch these days is still my analog Citizen Eco-Drive A-T CB0020-09E also known as the World Perpetual A-T (+£300 some years ago). OK it is a higher specification with 5 receivers and bought because the World Time function was the easiest of any to set and it has a large clear analog dial with no digital display. Pull out the Crown, turn to another city as indicated by the seconds hand, push the Crown it in again and the hands instantly move to the new City – it’s as easy as that! When I travel abroad this is still my preferred companion. However this Casio WVA-470DE-1AVEF works for me as a good RC indication type model and for under £100 is something else – Wow! Oops! – Seems I forgot to Post the first “Get and forget (1)” of the series – it featured Timex – though no matter I’ll post it next time . . . . . .